If you have a wood burning appliance, you know that having the right length of wood makes using it so much more convenient. 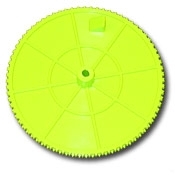 With this wheel accessory for the Mingo marking tool, you can easily mark the perfect cutting spot for 18 inch logs. This means you will have the right size logs which will stack nicely and fit right into your fire. Also, this wheel is simple to use and durably made so that you can use it again and again. The Mingo firewood marker simplifies cutting firewood the same length each cut. I cut 2 different lengths of firewood for my personal use. The options of different size wheels for different lengths makes this tool versatile to any person who cuts firewood.